A new review on the white nationalist rally in Charlottesville that turned violent criticized local police for their handling of the event. The independent report found the city's failure to protect free expression and public safety "represents a failure of one of the government's core functions — the protection of fundamental rights." The "Unite the Right" rally in question took place back in August, ostensibly protesting the removal of a statue of Confederate Gen. Robert E. Lee. The protest turned violent, killing one person and injuring dozens more. After months of investigating, Friday's review found the city's lack of coordination and preparation created "disastrous results." The report faults police response times and crowd management and notes they pulled officers back from the worst of the violence — like the intersection where one person was killed. The city also failed to seek input from other cities with rally experience and did not give officers adequate training and information, per the report. Top city officials have defended their efforts in response to previous criticism. The Charlottesville chief of police has said he regrets the loss of life during the event. The report noted police did try unsuccessfully to relocate the rally to a larger space, but said they waited too long before calling in state agencies for help. These missteps have "led to deep distrust of government within this community," the report concluded. The review suggested in the future officials should provide officers with specialized training, keep opposition groups apart, respond immediately to violence and communicate better with the public. 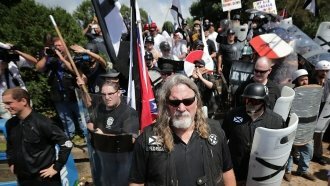 Charlottesville may have to begin seriously considering the advice — the rally's organizer is already talking about holding another white nationalist event in the city next year.